On the evening of June 17, 2015, a young man opened fire with a handgun at the Emanuel African Methodist Episcopal Church in downtown Charleston, South Carolina during a Bible study at the church, killing nine people, including its Pastor, the Reverend Clementa Pinckney. On June 26, 2015, President Barack Obama delivered a heart-felt, moving eulogy for the Reverend. Right around the same time, on a nearly daily basis, several Black places of worship were going down in flames. Over the course of centuries, black churches served as “hush harbors” where slaves could worship in safety; praise houses where their free descendants could gather and shout hallelujah, rest stops for the weary along the Underground Railroad; bunkers for the foot soldiers of the Civil Rights Movement. They have been, and continue to be, community centers where we organize for jobs and justice; places of scholarship and network; places where children are loved and fed and kept out of harm’s way, and told that they are beautiful and smart and taught that they matter. That’s what happens in church. That’s what the black church means. Our beating heart. The place where our dignity as a people is inviolate. When there’s no better example of this tradition than Mother Emanuel, a church built by blacks seeking liberty, burned to the ground because its founder sought to end slavery, only to rise up again, a Phoenix from these ashes. The 1822 burning of the Emanuel African Methodist Episcopal Church in Charleston, South Carolina, that Obama was referring to may have been the first such horrific expression of hate against fellow Americans expressed in such a manner but it would not be the last. Over the next two centuries there would be hundreds, if not thousands, of acts of violence against African-American places of worship, not only in the form of arson, but also bombings and mass murders. 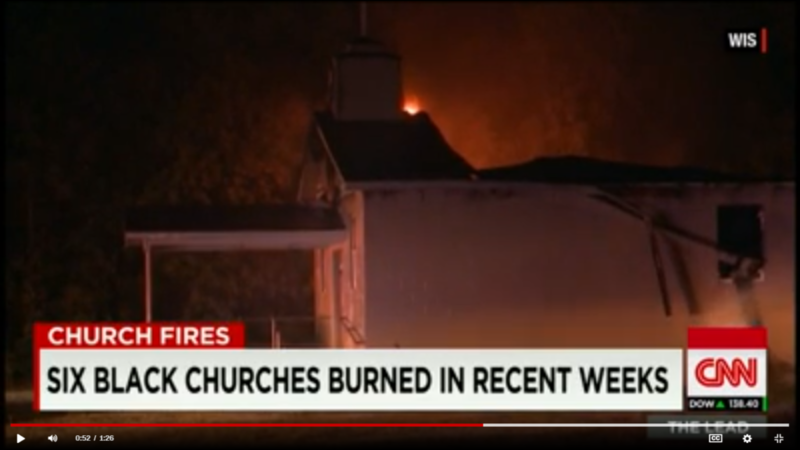 During the past two weeks, over a period of a mere 10 days, three historically Black churches in Louisiana were gutted by fire. To the best of my knowledge, Trump has not spoken out yet on this latest spate of church fires and possible acts of hate and violence. I am sure he is awaiting the results of the investigation to condemn these acts, if indeed they turn out to be acts of hate. We will update this post if and when such happens. An extensive, comprehensive and detailed report by the Pew Research Center on “Race in America 2019” may hold some answers. Read the first part of the report here. It will link you to the other five parts.